ComparePDF ComparePDF is a fast easy to use commercial Windows application for comparing PDF files, ideal for office workers. Comparisons are done on your own computer to protect your privacy. Qtrac Ltd. https://www.qtrac.eu/comparepdf.html 190 Software Qtrac Ltd.
ComparePDF compares two PDFs and shows any different pages side-by-side color highlighted. Click and choose one PDF; click and choose another PDF; click Compare. 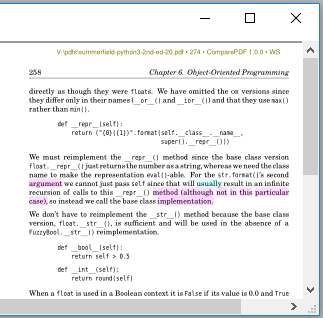 When two PDFs are compared, if differences are found, ComparePDF creates a PDF with each pair of pages that are different from the two PDFs side-by-side with differences color highlighted (as with a highlighter pen). 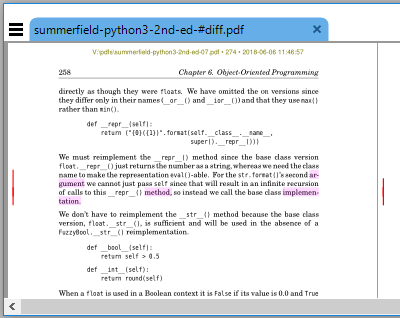 ComparePDF then shows the difference PDF in your PDF reader application. Comparisons can be made based on the text regardless of layout, or based on appearance (which accounts for fonts, colors, layout, diagrams, images, and so on). ComparePDF is fast and cloud-free: it runs on your own computer without the size or page limits of online tools—some customers compare PDFs with thousands of pages. "Your software is the best I've ever used for comparing PDFs. ", —customer feedback. ComparePDF is a 64-bit application that will work on 64-bit Windows 7, Windows 8, and Windows 10, on computers that have x86-compatible processors, i.e., almost all desktop and laptop computers. On the computer you want to use, download the installer: ComparePDF-1.2.2-setup.exe (15MB; MD5 0da00258ff204be57cd8fd2724c759a5). The first time you run ComparePDF it will acquire a free trial license key over the internet and be ready for immediate use. If you want to buy one or more licenses, visit Buy Now. Alternatively, run ComparePDF, check the Show Options checkbox, click the Register tab, and press the Buy Now button. Once you've completed your purchase the confirmation page will show the Order ID (which will also be emailed to you, along with a “get key” link). You can then use the Order ID or the link to acquire as many license keys as you purchased on each computer you want to use. The manual (click the Help button) explains how to acquire and register a license key once you've purchased. 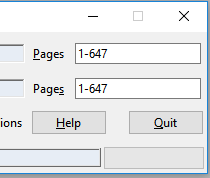 You can read the manual without even installing the software: Manual (173 KB). We recommend trying before buying, since license key purchases can't be refunded. Note that each free trial and full license key are tied to the particular computer it is acquired on. Each such license key is valid for all minor and patch versions (e.g., if acquired for version 1, it is valid for all 1.x.y versions). There is no time limit for full license keys—providing the hardware (and how Windows reports it)—don't change. Free trials and full licenses are governed by the comparepdf-license.pdf (24 KB). Here is ComparePDF's user interface with the options hidden (because the Show Options checkbox is unchecked). The application has lots of extra options for when you need them. Here is an example of a PDF difference report on Windows 10 using the SumatraPDF reader. ComparePDF will use whichever PDF reader you have installed and set as your default.